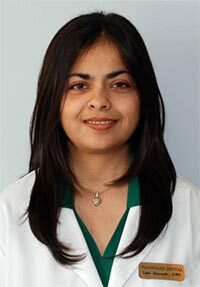 Dr. Yogita Kanorwalla is a practitioner and clinical researcher with over 15 years of clinical experience. She studied dentistry at the Boston University Goldman School of Dental Medicine. She has an excellent track record in using the latest technology and advancements in the field of dentistry to provide the best-suited dental treatment to her patients. Patients of all ages are extremely comfortable with her approach to dentistry and she has had great success in helping patients overcome their fear of dentistry. Dr. Yogita Kanorwalla has attended the prestigious Dawson Academy of dentistry. She is certified in the use of Invisalign® orthodontic clear braces. She is also certified in Sedation Dentistry* with certification in Oral Conscious Sedation and Advanced Cardiac Life Support (ACLS) through DOCS Education (Dental Organization for Conscious Sedation). She conducts research and is a member of the Executive Committee for the PEARL Network, organized and run by the New York University School of Dentistry and sponsored by the National Institutes of Health. She has presented research papers for the PEARL Network as well as the World Health Organization. She is a consultant to the Women's Standing Committee of the Massachusetts Dental Society. Dr. Yogita Kanorwalla is a member of the American Dental Association, American Academy of Pediatric Dentistry and the Massachusetts Dental Society. I am extremely satisfied with Vanguard Dental. Dr K answered all my questions patiently. I feel they treated me like family. Since my first visit, I have trusted them with a lot of my dental work. I have referred all my family and friends to Vanguard Dental. They all have had a great experience.